Welcome Fringe fanatics! I have to tell you, this season just keeps getting better and better. And with last night's episode the show was at an all-time high! The case of the week perfectly captured the essence of the overall theme of this season and opened the door to other possibilities for what on earth is going on. There is a tried and true saying that I live by with shows like this (and LOST). Sometimes you just have to be patient and TRUST THE WRITERS! They know what they're doing most of the time, and they take their time doing it. It has taken them 12 episodes to weave together a plot that is starting to tie together the fallout from the season 3 cliffhanger. I am more than thrilled with the direction it's all going and I just hope we'll have a chance to go through this turmoil again next year with a 5th season! But, let's not get ahead of ourselves. Plenty to discuss in this one first! Disclaimer: I am still having major issues with my screen capture software. So I apologize for the lack of many pictures. Most of the people of Westfield were suffering from duel personalities and ended up becoming very violent. There was a sudden infusion of memories that did not belong to them. Walter, with Peter's help, eventually cracked the code and figured out that the 2 universes were colliding in this very place and the dopplegangers were fusing together. We saw a dude with 2 irises and another woman with 2 rows of teeth. And let's not forget 2 face man! The culprit in this universe collision? Who else but David Robert Jones! That amphilicide mineral that he had mined a few episodes back has the potential to rip a hole in the universe. We eventually find out that he just used a fragment of his stockpile on the Westfield experiment. Which it seems is exactly what this is. He must be testing it out for a much larger objective. Not everyone was impacted by the universe collision though. We find out that if their doppleganger had made different decisions in life and do not live in Westfield, then they are immune to the duel personality effect. One guy said that he was offered a job in Philly and didn't take it. He must have in the other universe. Walter and Peter come up with a solution of how to save these people. They must get to the center of the activity. The "eye of the storm" if you will. They would then be protected from the implosion of the town. 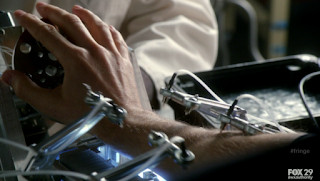 I must note here for discussion later, that the FRINGE Team in both universes were in the center of activity when that machine was activated in season 3 as well. COINCIDENCE???? So, our heroes and the townsfolk of Westfield head the eye which is in a bike shop, and they watch the world around them implode into nothing. All that was left was land in any direction. Westfield was blown off the map in 2 universes, timelines or whatever. Let's discuss some of the implications down below! Glyph Code: OLIVE - Well, I doubt we're talking about the food here! Olive was what Olivia was referred to as a child. And there was quite the revelation at the end of this episode revolving around her. Throw in the fact that September gave her a death sentence and there's plenty of things that this Glyph could be about! Thanks to Fringepedia for the screenshot. Observer Spotted - He was witnessing the plane crash in Westfield. Walterisms - The only thing that comes to mind is his description of where the word cocktail came from. It involved morning beverages and roosters. Walter's explanation of a breakfast drink wouldn't be complete without creating one. We got a Hot Cinnamon Roll cocktail that tasted mostly like butter. Sorry Peter! 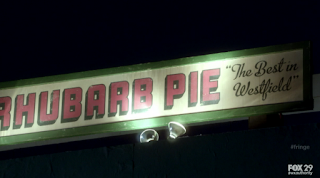 But, we'll always remember the Westfield episode's food of choice was a nice slice of rhubarb pie! Changes in Olivia and Walter - Okay, so the big things we saw in this episode were some changes in Walter and Olivia's behavior. And it all has to do with Peter being around. Let's discuss. This version of Walter has been cooped up in his lab never wanting to leave. Last week we saw him back in Peter and Walter's home. This week we see him make a trip to Vermont (without realizing it). Peter seems to be bringing "the Old Walter" out of him. Peter even has made several comments indicating that this Walter reminds him very much of his own Walter. I know I keep saying it, but this episode seemed to indicate more that Peter is already in the right place. 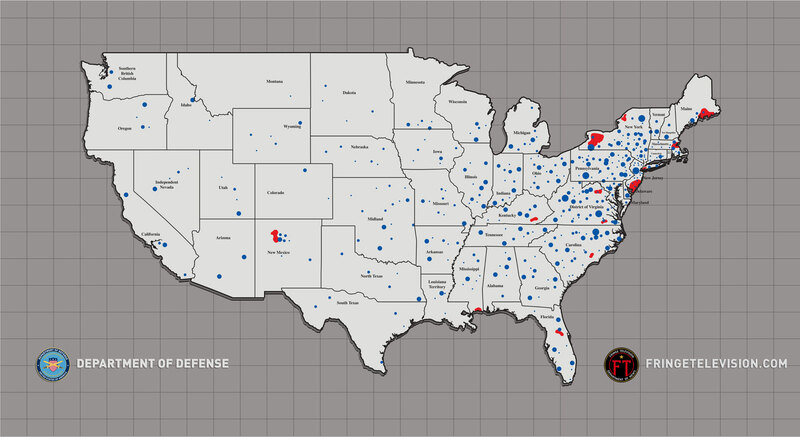 There are obviously still issues with that theory, but let's keep discussing. Olivia, meanwhile, was remembering cases that Peter and OUR Olivia worked on in the original timeline. Peter also described his Olivia to this Olivia recalling all the way back to the pilot episode when she found him in Baghdad. He told her that Olivia gave him a place to call home, the first time since his mother died. They also had a thing. Cheesy horror films with takeout from Damiano's. And let's not forget the saucy dream that started off this episode. Olivia was having a dream of a very intimate moment with Peter where they both told each other that they loved each other. When she woke up she was definitely looking at Peter differently! At the end of the episode, Peter comes over to Olivia's. She's busy fixing her hair and when he comes in she says how she got Damiano's and then they start kissing. WHAAT!?!?! I don't want to start discussing the preview for next week but it would sure seem like Olivia's memories are either A.) Returning or B.) getting mixed up with our Olivia's. Since I'm still under the theory that this IS our Universe just "off its kilter" a bit, I'm inclined to think that her memories are returning. I'm sure it won't be that simple though. Of course, we also need to wonder if Nina Sharp's drugging and the migraines are involved with this mind switching phenomenon. And of course, we can't forget discussing the MACHINE! Basically, every episode this season, I keep bringing up the machine. It was my biggest issue with this timeline. If Peter didn't exist, how could the machine exist? It was built to use his DNA. I wondered how the bridge could even exist. And I wondered why both Fringe teams didn't question the bridge's existence or the machine. 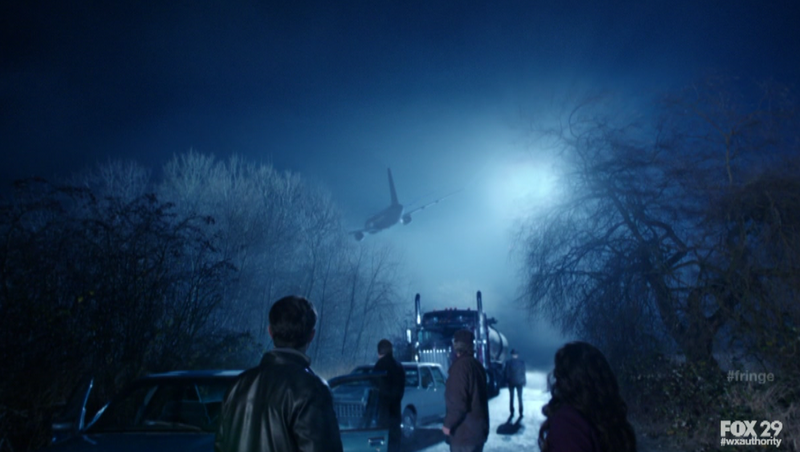 We seem to have gotten a bit of answer with this episode, of course not without more questions still. Peter and Walter came upon the startling discovery that the machine is most definitely linked to Peter. Peter thinks this is key to getting him home since it's how he got here in the first place. That's great and all, but if Peter didn't exist then why would it be linked to him? It all seems to be pointing towards some kind of MASS MEMORY changer. I started thinking if it had anything to do with who was present in both Universes in that "EYE OF THE STORM" when the machine was activated? Walter, Walternate, Olivia, Fauxlivia, Our Broyles, Alterna-Brandon. (I didn't remember all of it, had to look it up in my older post) We know that Alterna-Brandon is dead in this new reality and was replaced by a shapeshifter. No telling if that was the case before the machine was used or directly after. The rest of those people seem to have affected memories (if we're going with this theory) of Peter. But then again, Astrid wasn't there and she has been impacted too. Peter's REAL mother wasn't there and she remembers him dying in 1985 too. Okay, so maybe this bullet doesn't make much sense. But what if the machine sent out some electromagnetic signal that is infusing people with memories and ripple effects of those memories of the person who was in that machine, aka Peter? It surely cannot be a coincidence that we had this story about people having memories that weren't their own and the whole "eye of the storm" thing. I can't quite piece it all together yet, but it's getting there. David Robert Jones was most certainly dead. Alterna-Broyles was most certainly dead. How are they back? There's a chance Broyes is a shapeshifter. I guess there's a chance Jones is too. MAYBE there's a chance that Nina is behind the whole thing. Maybe Nina knows about the original timeline and is behind this whole memory thing. Massive Dynamic did have access to that machine for a long time before Peter stepped into it. She may have stumbled upon the effects of using the machine and what it would do. And maybe she's using that knowledge to her advantage. I'm really stretching here, but I'm just taking an idea and rolling with it! The other big question is, what about Peter and Fauxlivia's child!? If this is our universe where is he? I guess there's a chance that he could still be around, but Fauxlivia has no memory of him because she has no memory of Peter. But then where on earth would he be? These are pretty big issues with the theory, so we do have to consider alternatives. The most obvious alternative is that this Olivia truly is a DIFFERENT Olivia, but she is getting memories from OUR Olivia. So maybe OUR World is merging with this timeline. Or maybe just Olivia is. But, we can't forget Walter is starting to act like Our Walter too. And once again, Peter just happens to be involved in all of this. Lots to think about! Lots to theorize about! I think I've essentially talked myself in circles here so I'd love to hear other people's takes on this episode. Regardless of its mind boggling-ness, it was one fantastic hour of Fringe! Can't wait for the next one! Hope you enjoyed my ramblings and I'll see you next week! I'm with you on most everything you wrote. I am begining to think that Peter is home, this is the same time line with just any memory that involved Peter gone. As well as any event that Peter was integral in the outcome being different. For instance, Jones. Peter wasn't there to close the gate on Jones (effectively cutting him in half) so Jones is still alive. There could be no Peter Jr with Feauxlivia since Peter was never there to get her pregnant. Broyles was killed for helping Olivia escape in the original time line but since Olivia didn't go on that adventure he never died. It seems like only the memories are rippling through time and those with close contact to Peter seem to be getting those memories back. I have noticed a difference in both Walter and Olivia with respect to how Peter's presence has changed them (since the beginning of Season 4). The paradox though is that if Peter wasn't there those memories may be real but they never happened in this time line's reality. As Johnny Carson would have said, "weird, wild stuff". You are also right in having some faith in the writers (something hard for me to do) because they seem to be on top of the direction of this show and it looks like in the end most of us will be satisfied. Let's face it, they have a lot of latitude as to what they can do because this show is pretty far out there, but that's why we like it so much. I can't imagine where this is all going to end up but I give this episode a 10 for being both an interesting "case of the week" and providing answers to the larger story arc. One thing that didn't get addressed was the time event that Walter experienced with the rhubarb pie guy. He had ordered and had the pie in front of him and then it wasn't and he had to order it again. None of the other characters experienced that time effect. (or did I miss something). So what exactly was that and why only Walter? Anyway, I can't wait to see the rest of the season and I too hope that we are blessed with a 5th season. Glad we're close to being on the same page Bill! lol The only thing throwing me off are the significant changes (i.e. people being alive vs. dead. existing vs. not existing) Of course..maybe it's similar to Peter disappearing...maybe Henry (baby) disappeared when Peter disappeared...but maybe if people start remembering their TRUE memories, things will start reverting. Who knows? I still don't think we know for sure if Alterna-Broyles is currently alive. As we have speculated, he is working with Jones so there's a strong chance he's a shapeshifter. Which actually works for the story since he is dead on the "original timeline" (for lack of a better phrase right now). Olivia was still OVER THERE for a bit and still had to come back. So there were still reasons for crossing over and she needed someone to help her back. It could have been Broyles. My personal opinion is that we may never hear about these details of revised history....but we may not need to. It could only be in their heads that these events are skewed. This Olivia may still have been aided by Alterna Broyles...and her whole motivation for being over there and returning was still Peter. She just doesn't remember. The Machine was built in the future to be used by Peter...and it was...they just don't remember. So once again, how is Jones alive and how does Henry not exist? I'm sure we'll find out something. As i suggested...it could be Nina Sharp being the mastermind behind the shapeshifters and has revived a version of Jones. Who knows!? I think the great part about Fringe's low ratings is that the showrunners feel like they can get REALLY OUT THERE with the audience that's left. They're the people that are committed to this crazy story and it allows them to push the boundaries on network television. It has really led to some awesome material! Agreed on giving the episode a 10. It was some of their finest work. I did feel like there was "time event" at first too with Walter. But on second glance. If you recall how Walter behaved, he was confused by the pie guy's behavior. He was the one who forgot he served the pie. It was the whole 2 universes merging into one event. He kept going back between 2 different consciousnesses. I don't think there was any TIME event like we were seeing earlier this season prior to Peter's re-entry. Regarding the pie, I am going to have to watch that part again. I thought Walter had a piece of pie in front of him and then he didn't. I thought the pie guy had to actually serve him a piece a second time. Sounds good Bill, keep me posted! You could be right. I remember taking notice at the time thinking something really weird was going on but then I just thought it was resolved by the end with the merging universes. But, it wouldn't be the first time they dropped a subtle hint of things to come in episodes before! I'm swamped at work again ! I was able to read the Fringe recap this week - never did get to really read last weeks - but have not yet read the comments. Gotta go - will try to get bak later - but I loved this ep. SO exciting at the end! And the dual persons remembering stuff that never happened was fab. Shameless - dang - they acutally had me feeeling sorryu for Frank. that's all I'll say. Will try to get to the Walking Dead thread later. I didn't want to let anyone down on the LOST angle of Fringe! :-) lol There were definitely some similar things going on and I didn't mind one bit. Sorry you've been so busy! I'm sure things will settle down eventually. As far as Shameless - I didn't get to see it yet. Last night was all Grammys for me with a Walking Dead nightcap...so I have to catch up on ONCE and Shameless. It's only going to get worse tonight because SMASH will be airing when I usually write my Alcatraz recap! lol But I'll definitely watch at least HIMYM and Alcatraz. Rolling Stone had an article in the Feb 16th edition about Alcatraz and JJ Abrams in general. 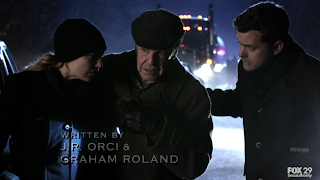 "If they're the children of LOST, Fringe is the dutiful older sibling who does extra homework striving to impress. Alcatraz is the lazy kid brother who breezes along and charms everyone. You don't need two Ph.D.s to guess which one gets the higher ratings." We'll see how true that is in the long run. Perhaps that is a good observation to explain Fringe's ratings issues but it is too early to tell how the ratings will hold up for Alcatraz and whether everyone will truly be charmed by it in the long run. Thanks for sharing Bill. Yeah, kinda ridiculous to compare a 4th season show vs. a 1st season show. No one remembers but season 1 of LOST wasn't very hard to follow at all. It was basically a show about beautiful people (and Hurley) on a mysterious island trying to survive. There were flashbacks that expanded character's stories and there was a revelation of a hatch and that they might not be alone on the island. 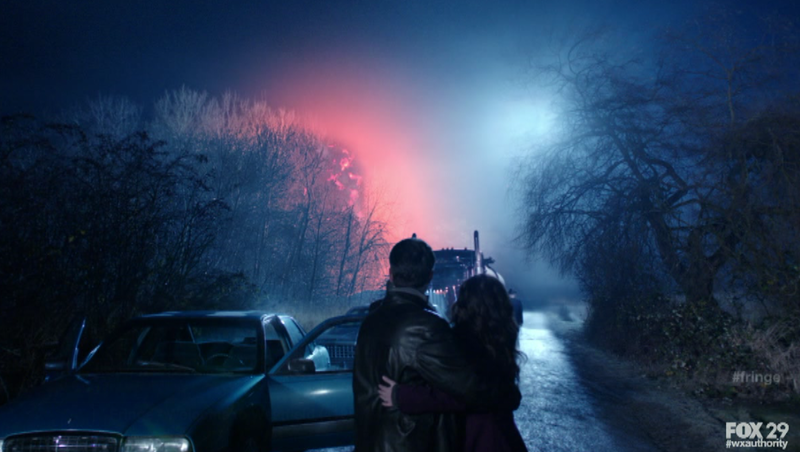 Everything else was shrouded in mystery and it didn't matter. Sure there were fun things to catch in each episode. Like Locke getting up for the first time and us not realizing that he was previously paralyzed. Hurley was on a TV in a Sayid flashback because he won the lottery (before we saw his flashback). But there wasn't anything overly complicated about it. It wasn't until season 2 that they started diving into the mythology of the Island. We learned about the DHARMA in season 2, learned more about The Others, about Smokey....and kept diving further in in season 3 until we left the island and then started focusing more on time travel aspects and whatever else. Plus, those character storylines got a whole lot more complex because we were much further into the show's run and their arcs just got more detailed and tied in with everyone else's and what not. 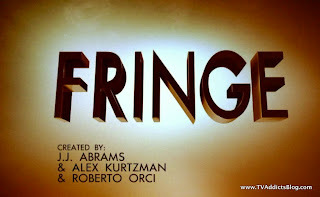 Fringe started off as a pseudo X-Files for the new generation. Procedural episodes each week with not much ties in between each one until near the end of season 1 when they tried to tie it all together with the alternate universe thing. Then the mythology started taking over. I don't think Rolling Stone remembers but Fringe was a HIT show in season 1 because it followed American Idol. (and because it was still good even if it wasn't as good as it is now) The viewership declined when it got moved to an overcrowded Thursday night and the story started getting harder to follow. (more serialized requiring people to view every week. If they couldn't find it, they got lost, hence gave up) Now there is a smaller audience and the writers have let their geek flag fly and it's for the benefit of Science Fiction fans everywhere! Totally spoilery article on Fringe. I couldn't help myself and read it. OMG !